An easy way for the recreational or beginner rider that has been scared of giving up their flat pedals and shoes to get into the benefits of a clip less pedal and shoe combination. From the engineering minds that invented Shimano Pedaling Dynamics come Click'R pedals and shoes, a whole new way to get the benefits of clipped in pedaling efficiency within an easy-to-use, intuitive system. Once again, Shimano has revolutionized the cycling experience. 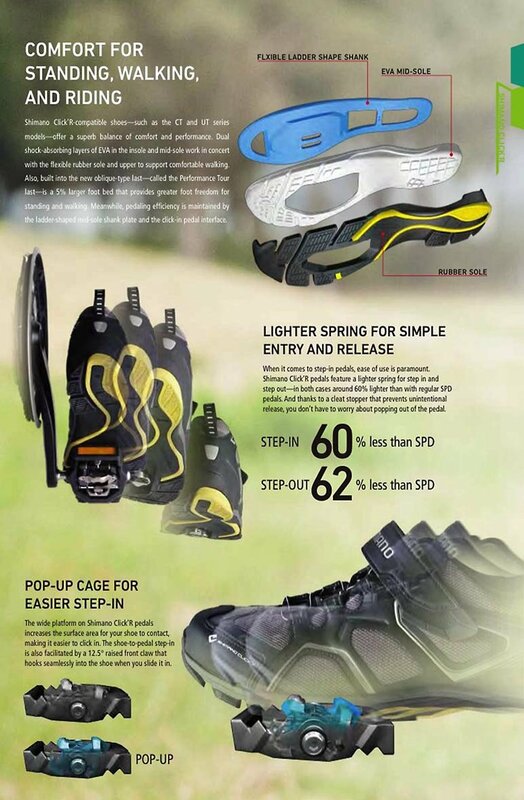 A family of comfortable, walkable, Shimano quality shoes that fit both entry level and the seasoned enthusiast’s needs. With a unique sole construction, Click'R Walk+Ride footwear offers all-day comfort with on-the-bike precision and off-the-bike ease. This system is offered in the widest range of sizes for every cyclist with perfect fit and comfort, in styles that run the gamut from athletic to urban chic. A collection of light action, wide platform pedals with Shimano innovation, engineering and expertise built in. From the entry-level rider to the committed commuter, from avid cyclist to MTB enthusiast, Click'R offers the most accessible way to get all the benefits and efficiency of being clipped in: better bike control, faster, longer rides and more confidence. The wide platform on Click’R pedals increases the surface area for your shoe to contact, making it easier to click in. The shoe-to-pedal step-in is also facilitated by a 12.5° raised front claw that hooks seamlessly into the shoe when you slide it in.